Currently viewing the tag: "door installation"
Back in my day, installing a door used to be a skill, but now these newfangled do-dads make it so easy a dad-gum fool can do it. OK, so maybe that’s an exaggeration, but door installation kits have come down in price to the point where they practically give them away with a lock set. Usually these kits are made for locating and drilling the holes for the lock and latch, and leave you to your own devices to mortise out the the door so the latch sits flush. 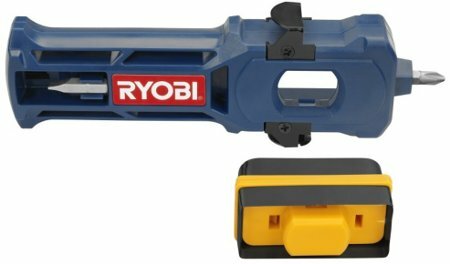 Like its name says, Ryobi’s door latch installation kit is an all-in-one tool for installing door latches. With it you can score the outline for either rounded or square latches, then chisel out the mortise to the correct depth. There’s even a built-in screwdriver on board for screwing in the latch.